Those who have worked and played in the National Press Building may be surprised to learn how much espionage went on in the offices and even in the Club from the years leading up to World War II through the Cold War and into this century. Historian Steven T. Usdin has dug deep into once secret files of the FBI and the KGB to reveal what happened in the building even as hundreds of regular journalists went about their jobs reporting the news. 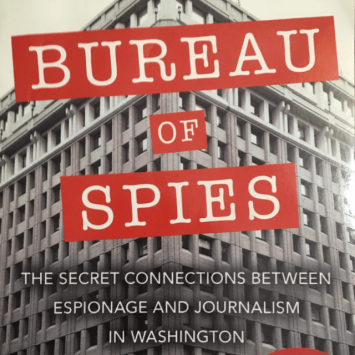 The result is his book, Bureau of Spies: The Secret Connections between Espionage and Journalism in Washington. Usdin will present his findings—even some big names in Press Club history surface—in a talk that will be moderated by Mark Stout, past historian at the International Spy Museum and president of the North American Society for Intelligence History.